A recent article by MediaPost reported that out-of-home advertising revenue continues to rise, despite total ad spending declining nearly 7% for the 2nd quarter in 2015. Out-of-home and local radio are the only forms of traditional media seeing significant growth, with out-of-home rising nearly 3.8% in the 2nd quarter. As the leading OOH marketplace, DOmedia has identified 3 reasons for OOH continuous growth and success. Manhattan wallscape via Outselling, Inc.
Great Reach – With increasing mobility, consumer are away from their homes an average 70% of waking hours per day. Out-of-home advertising provides more reach to the on-the-go consumer, as it is visible on their commutes in various formats: roadside billboards, bus wraps and even stair graphics. Out-of-home can reach consumers in ways other categories of traditional media cannot. Great Value – Out-of-home is highly efficient as it delivers impressions at a lower CPM, saving advertisers big bucks. Television advertising typically has high CPM costs and production costs. Print advertising has costly frequencies, low reach and high clutter. Out-of-home provides more cost efficient advertising, with a range of $3.38-$8.65 per thousand impressions nationally. 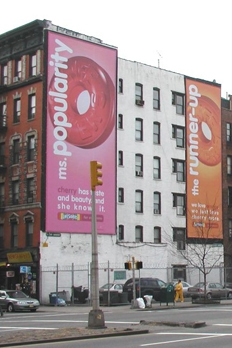 Great Creative – Out-of-home advertising gives creative teams freedom to be innovative on a whole new level. Companies like Apple are utilizing their own customers’ photos for breathtaking wallscapes. Nationwide Mutual Insurance Company captivates pedestrians with 3-D images. Out-of-home advertising allows companies to showcase their creative abilities on large scale formats that isn’t possible in other forms of traditional media. Great Timing – With the presidential election arriving in a year, campaigning is in full swing. Political candidates realize reaching millennials could be the key to success in the 2016 race, but reaching these millenials has proven difficult. Millenials are on the go and becoming immune to traditional advertising, but OOH media offers the opportunity to grab their attention.